Come join this camp to learn more about yourself, discovering new knowledge and meet like-minded friends this December to kick-start your new year! 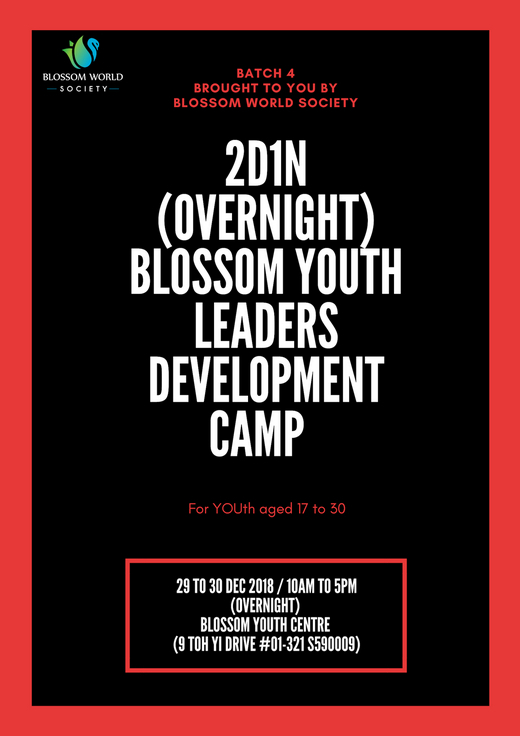 This camp is specially designed for you (aged 17 to 30) and you will get a hands-on approach in initiating and organising meaningful events for the community under the guidance from Blossom World Society. In Blossom World Society, the organisation aims to build a generation of youths who do not focus solely on personal achievements such as academic success, but possess strength of character with the right values as well. Its mission is to empower individuals with knowledge and skills to lead, and serve. What you can expect from the camp?